Want a quick soul satisfying dish for dinner or lunch without having to get a store bought crappy pun net. so it may take a little more time than nuking in a micro-wave. Here’s a total no brainer that any Klutz can prep and cook fast. Good and tasty all in dish one comfort food, ok make it two dishes then by adding a quick salad on the side and presto there’s a wonderful dish to serve at any time of the day. Yummolicious or what? Enjoy! Heat the oil in a saucepan and add the onion and sauté until translucent. Add the tomatoes and frozen vegetables, season and bring to a boil. Cook rapidly without a lid, stirring often, until the liquids have reduced significantly. Whisk the sauce powder into the water and add to the vegetables and stir until thickened. Remove from heat, stir in the cheese and pour mixture into a greased baking dish. 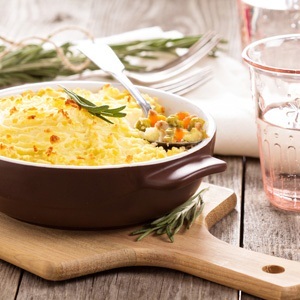 Spoon the mashed potatoes on top and spread evenly over the vegetables. Mix together the melted butter and parsley and drizzle over the top. Bake for 10 minutes in the oven, preheated to 190ºC, before serving. Reprinted with permission of I Love Cooking.